Creating an interactive fabric instrument that brings the Ethereum community together. 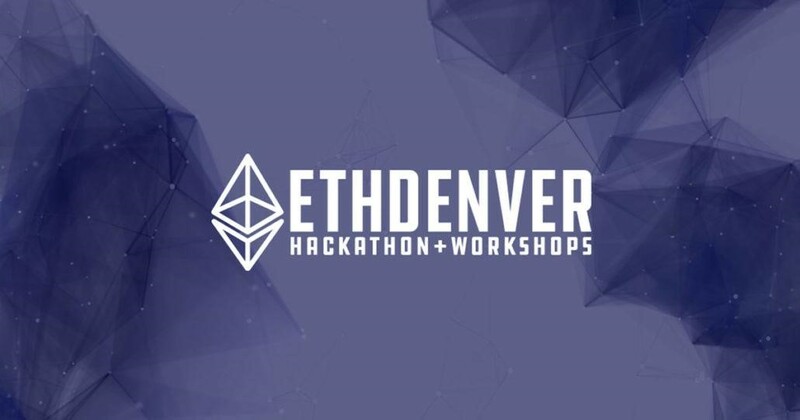 The largest Ethereum hackathon in North America was looking for interactive ways to bring the Ethereum brand to life for their audience. The organizers had kegs of Kombucha, artisan food trucks, an art zone, and 1000 eager developers ready to progress the Ethereum ecosystem, but they still needed more experimental expressions of Ethereum and the arts to stimulate the imagination of their audience. To address this need, Alt Ethos transformed the three-dimensional Ethereum logo into a physical instrument that could be played by touching various lycra surfaces, allowing users to explore new possibilities at the intersection of experimental sound design and cryptocurrency. 1.Connect strangers through a physical installation that fosters conversation and inspires new relationships. 2.Spark the imagination of the developer community through an interactive Ethereum experience. The journey began with thorough user experience research to better understand possible manifestations of the Ethereum ecosystem in the physical realm. Through studying fundamental components of the blockchain, the ethos of the Ethereum community was identified as inquisitive, inclusive, and fully open to embracing experimentation and seemingly wild ideas. Paired with an understanding of the unique social dynamics of hackathon environments, the Alt Ethos team strove to create an experience that would spur further connections and conversations among strangers in the community. 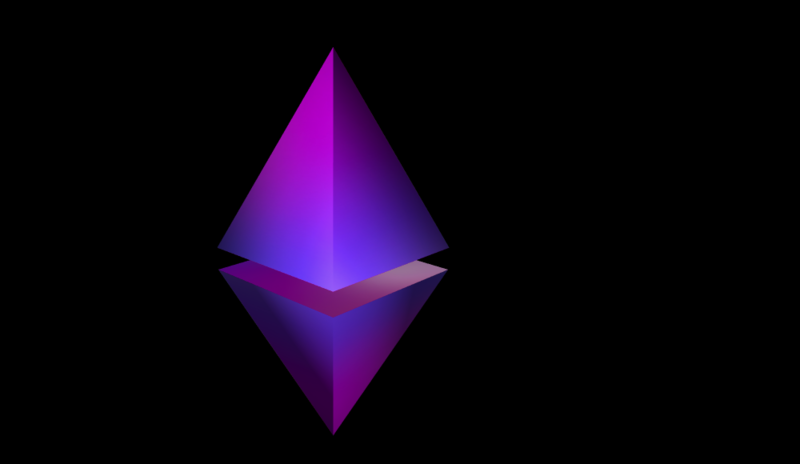 The design phase highlighted that the three-dimensional form of the Ethereum logo presented an opportunity for two explorers to collaborate by taking advantage of the four unique faces on the floating diamond. The sound design specifically accentuated different tracks and audio synthesis methods in the musical composition when the user pressed two hands on two faces of the instrument. The intention was for the musical composition to grow and find a sense of synergy as another user pressed the remaining two faces, thus creating an intimate setting for two people to openly play together. The development and testing of the exhibit occurred in a series of sprints. The major benefit of the sprints was iterative testing of the sound and light curation to ensure that the audio synthesis techniques on each face of the diamond smoothly integrated into a cohesive aesthetic. Using continuous data feeds from time of flight lidar sensing technology enabled the installation to become a low latency interactive experience, which was essential to forming a playable instrument with an instantaneous feedback system. The fabrication of the structure was purposefully modular in nature to allow for an easy take down, setup and transportation. The design of the software and firmware of the installation was automatically configured to allow for a simple two-step process to turn the installation on. After the pieces were put in place, all it took was for the power cable to be plugged in and the “on” button to be pressed to complete the setup process. After the implementation and delivery, the installation was a focal point of the art zone and acted as a key interactive tool in connecting members of the community through shared experimentation and a sense of discovery. When members of the audience watched others touching and listening to the instrument, they were inspired to come up and ask other members of the audience what they were doing. In teaching each other about the installation, the observer turned into an active participant and player often using the installation as an ice breaker to form a connection with another attendee. 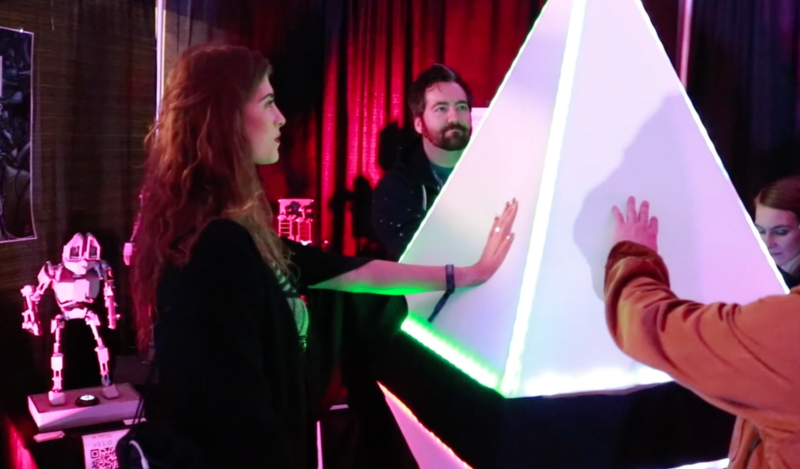 Alt Ethos was able to create an interactive display that reinforced branding, addressed the unique environment of an Ethereum hackathon and encouraged participants to form new relationships through exploratory play. The system provided a creative solution that was able to get participants conversing and with a design that makes it easy to setup and install, the device has the potential to continue to engage audience members in the future.